Plants, like peppers and tomatoes, can benefit from a longer growing season. This is accomplished by starting them indoors a few months before the latest frost. Our typical latest frost in Albuquerque is April 15th. Some years we may have to wait a couple weeks longer. It does take some time and effort to do this, so I don't do it for plants that don't need it. If you're only planning on planting a few plants, it's a lot easier to just buy them in the store. Last year I planted ~200 peppers and over a dozen tomatoes. Some of the plants I just buy. Most of the ones that I start early are ones that I can't find in the store or get as early as I want. Last year the green chile plants I bought started out well and where ahead of my plants. In the long run, my plants where healthier and produced much better. By selecting my seeds over the years, I have been able to produce superior fruits. It's not sure-fire, so I plant seeds from different years. I store my seeds in small sealed zip-lock bags in side another zip-lock in the freezer. 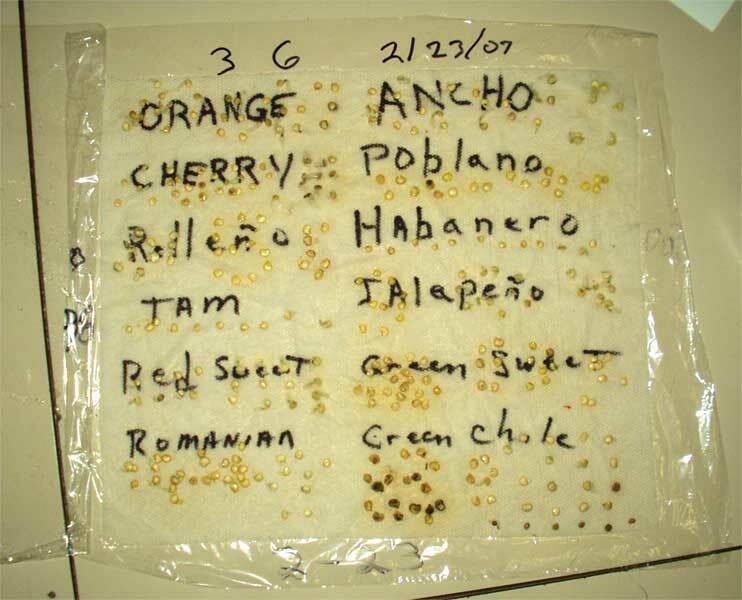 I have been able to keep pepper seeds viable for over 5 years. 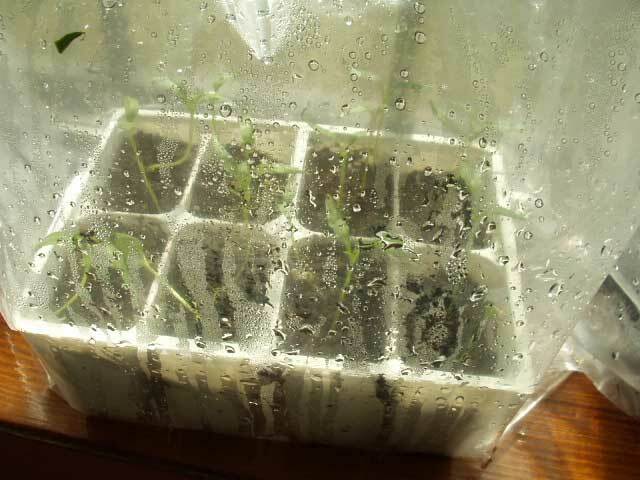 Make sure the seeds are completely dry before you seal them or the will mold. 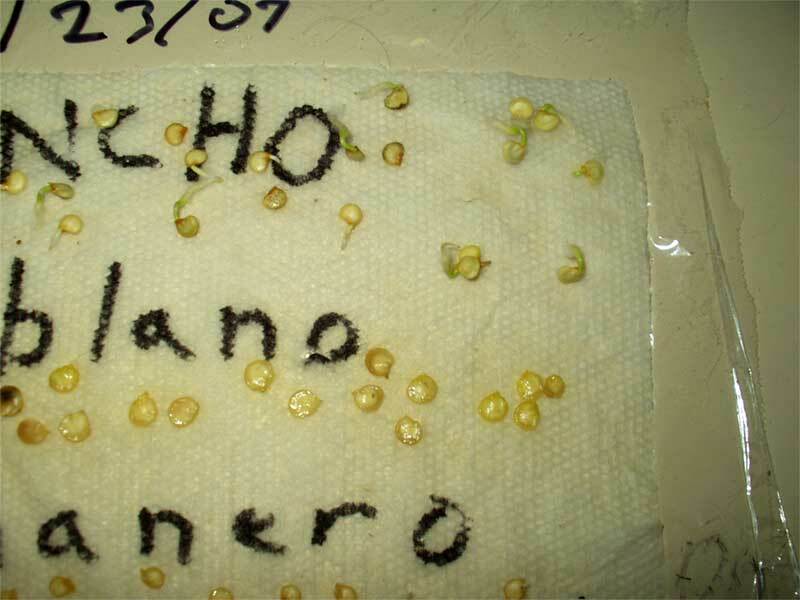 Another reason for starting your own seedlings is to avoid genetically modified plants. I'm not going to get into that here. Other plants that you may want to start early are okra, artichokes(globe), brussel sprouts and some flowers. I do not recommend starting squash or melons for transplanting. They don't like transplanting and it is difficult to do without damaging the vines when you move them. It is better to use a cold frame for them, if you have to. Decide what you're going to start. Lay out a piece of plastic wrap twice the size of a sheet of paper towel. Place a sheet of paper towel on the plastic wrap. Label the paper towel with names of the plants. The number of seeds you put down will depend upon how many plants you want and the viablity of your seed. Fold the plastic wrap over and seal the edges. Place the sheet in a warm place where it will get some light. Most seeds want light to germinate, though some like it dark. 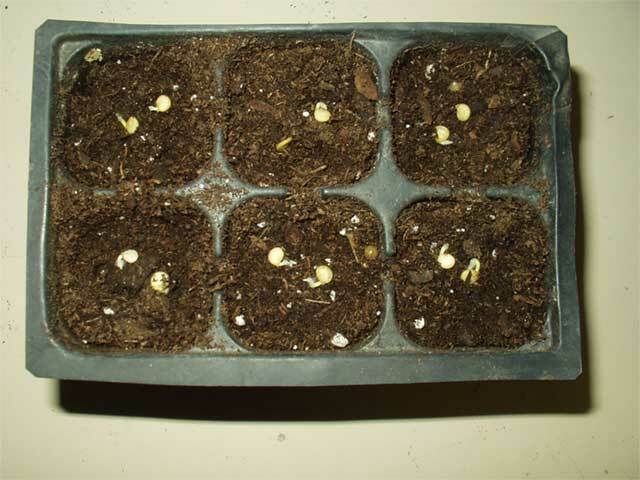 The seeds should start sprouting in two or three days. Some seeds will take longer. When the sprouts are 1/8 to 1/2 " long they are ready to plant. Don't let them get to long because they will embed in the paper towel. Don't let the paper towel dry out. Saturate the potting soil with water, then let it drain. A drop of LOC or dish soap in the water will make the water wetter and let it be absorbed more readily. Plant the seedlings in potting soil in the starter pots. I put two in each one. Cover the seeds with ~1/4" of soil. Put the plants inside a gallon zip-lock. Blow the zip-lock up with your breath and seal it. You exhale carbon dioxide and the plants love it. You'll have to blow them up every day or so. Place them in a warm place in sunlite or under fluorescent light. I move mine under the lights at sundown. I use 4 - 40 watt fluorescent bulbs 2 feet above the plants. You shouldn't have to add any water after you start. The next step is the most critical. 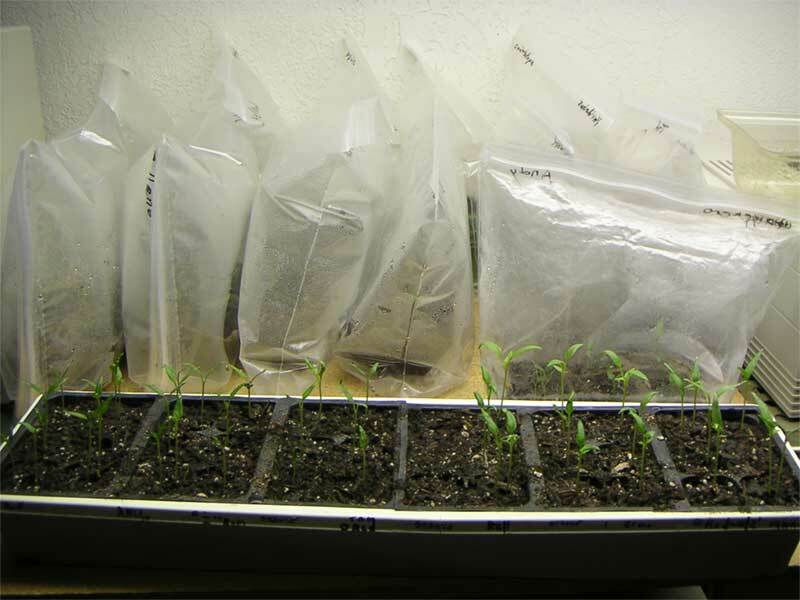 When the seedlings get tall enough that the leaves are about to touch the zip-lock bag, you have to start there transition to the real world. They love the high humidity and high CO2 of the mini-green houses. If you just remove them from the bags, they will croak. You have to make the transition over a few days. Start by opening the bags a little bit. Increase the opening each day until they are able to tolerate normal conditions. Watch the leaves. If they look stressed, you'll have the close the bag until they recover and than try it again more slowly. Once the transition has been made, remove the bags. You will have to water the plants as needed. 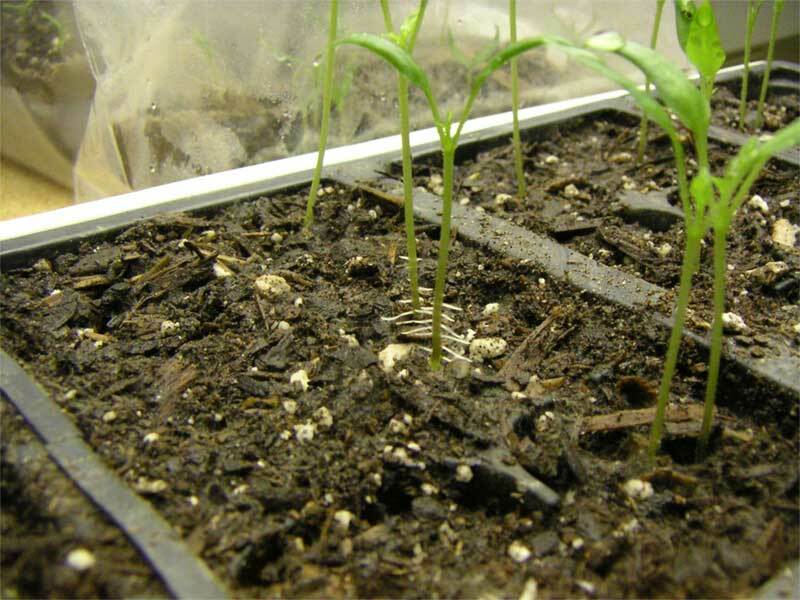 If there are roots above the potting soil, transplant into a larger container. As the weather gets warmer, start acclimating the plants to full sunlight by setting them outside. Start in light shade and slowly increase the amount of time and sunlight until they can stand full sunlight. Be careful! You can lose everything in less than an hour, if you go to fast. Don't plant them outside until all danger of frost has past. When you plant them, remove the lower leaves and plant them with ground level about half way up the stem. This applies to peppers and tomatoes. Mulch around the plants to conserve moisture. I've experimented with leaving two plants together vs. cutting one off. Leaving two together helps them support each other in the wind, but I don't think the yield is as high.